The Marvel Cinematic Universe and the upcoming Spider-Man PS4 game feature fairly different versions of Peter Parker – the movie Spidey is an inexperienced highschooler, while the game offers an older, more skilled take on the hero. That said, there’s no reason Avengers: Infinity War and Spider-Man can’t cook up a little crossover action! Today Sony revealed one of the costumes in their upcoming Spider-Man game will be based on the “Iron Spider” look from Infinity War. Check out a quick trailer, below. 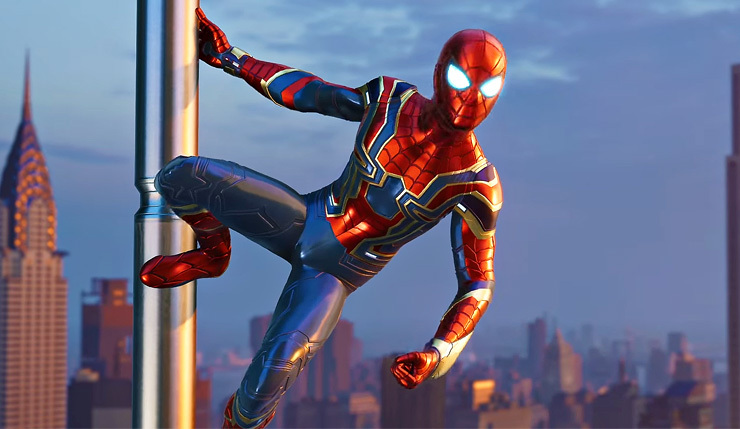 “In Marvel’s Spider-Man, having a variety of suits for players to use was a must-have for us [at Insomniac]. We looked across all of the Spider-Man lore for inspiration, and in the final game you’ll find suits inspired by comics and film, as well as original suits created by Insomniac and other artists. Each of the suits looks absolutely spectacular and we can’t wait for you to see more of them. Folks who pre-order Spider-Man get a Spidey Suit Pack containing three costumes. We know the pack will include the Spider-Punk and Iron Spider suits, but we don’t know what the third one is yet. I’m holding out hope for a Spider-Ham outfit. Spider-Man swings onto PS4 on September 7. Avengers: Infinity War hits theaters this Friday.